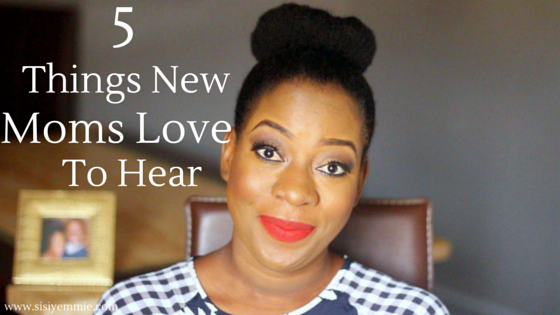 Remember that my video about 5 Things Not To Ask A Pregnant Nigerian Woman? Well I decided to do a follow up about 5 things I think new moms world over love to hear. From my experience there are a couple of things I've heard that just make me feel like I'm party jollofrice. SUBSCRIBE to my youtube channel and watch the video below. We like tp hear well done, it brings us great joy to know that you can observe that we are working hard to take care of our baby, nurse him/her in great health. Sometime's I get random comments/emails that "oh Titobi looks so healthy, well done", "you're doing such a great job"! I always feel like such a DoroMegaSuperStarO. Please don't stop with the compliments. Someone told me in THIS video-"for someone who just had a baby 3 months ago you look great". I don't care if the man was telling lies but I took that compliment on board and i'm sure I floated while walking a bit. Find something to compliment. We don't need validation from anywhere to know our babies are cute, handsome, beautiful, adorable. It's just really nice to hear it from total stranger or even friends and family, just the way I like to receive compliments that I'm fine. I'd like to know that I did the world a favour by producing a good-looking human. Yes please! help me carry him, if you like help me change his diaper-I won't complain. But wash your hands first or sanitize. LOL. Babies seem to want attend 24/7 so if you offer to help in any little way I will not mind. This goes to daddies, aunts and uncles, cousisn, friends, inlaws, siblings. Everyone pitch in! Shebi dem say it takes a whole village to raise a child-epp me! As a new mommy I can defo tell you that I'm not okay most of the time. I'm sometimes stressed out, tired, sleep deprived, hungry, sad...these are some of the feelings I have. It feels nice to know that someone wants to know how you are doing, how you are coping and if everything is okay. Ask me once in a while. I might say I'm okay or I might burst into tears-depends on what kind of day i've had. LOL. Don't tell me that my baby's cries are the loudest you've heard. Don't tell me that his poo stinks the most. Don't frighten me with horrible baby stories, i.e "just wait till he starts crawling, your life will be over then. "...nah don't do that. Share your own experiences with me positively, maybe something like "if I can handle it, you can too"
I love to hear that compliments about my baby. Especially beyond looks. She's smart, she smiles a lot etc. i love to hear you have lost most of your baby weight,your face is no longer swollen.it gives me joy. All you said is on point. Don't tell me his trouble is plenty. Or he doesn't smile enough or say hes big/small for a 3month old. I think the most important one is HELP and pls do it right. Put your hand behind his head. Don't throw him up-he doesn't like it. I know your child enjoyed it back then. Mine does. End of discussion. My baby would be 5 months old on the 17th of this month and I must say that all the above points are true especially the 'let me help you'. My boy is weighty so you could imagine how relieved I get whenever someone offers to carry him in fact I like to disappear for few minutes especially if it's in church and when the person is trusted lol. You look good mummy Titobi. God bless your family. Beautiful video. Would you please do a piece about why you decided to have your baby in Nigeria and not abroad ? Why did you decide not to follow the trend? I can't wait... Thank you Lord!